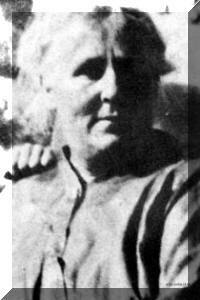 3-Elizabeth Ellen Appleby was born on 22 May 1869 in Westbury, Tasmania, died on 8 Aug 1928 in Mole Creek at age 59, and was buried in Mole Creek. Elizabeth married Edwin Ashdown, son of Henry William Ashdown and Sarah Ann Pickett, on 31 Dec 1888 in Eleanor & William's home in Exton, Tasmania. Edwin was born on 30 Aug 1865 in Deloraine, Tasmania, died on 14 May 1901 in Chudleigh, Tasmania at age 35, and was buried in May 1901 in Mole Creek Public Cemetery. Elizabeth next married her brother-in-law Walter Richard Pickett, son of convict ↑Daniel Pickett and Mary Howe, on 20 Jan 1904 in St John's Church of England, Launceston. Walter was born on 24 May 1859 in Deloraine, Tasmania and died on 9 Nov 1928 in Latrobe Hospital at age 69. Elizabeth attended school at Exton and moved with the family to Chudleigh and Mole Creek. It would have been at this time that Elizabeth met Edwin Ashdown the son of John Ashdown who owned and operated a lime kiln and farm at Chudleigh. Elizabeth and Edwin were married by Rev. Edward Couper Tennant, a Presbyterian minister, at Elizabeth's parents' home at Exton on 31 December 31, 1888. Edwin and Elizabeth spent their first years of married life living with Edwin's parents in the old family homestead on the farm at Chudleigh. They had five children, one boy and four girls. Unfortunately Elizabeth was left with a young family to bring up on her own, as Edwin died when only 36 years old. In those days rabbits were in plague proportions and had to be poisoned. Edwin always used to mix all the phosphorus poison and didn't take the precautions of preventing the inhalation of the fumes as he had been advised to do. He died with lung cancer. Some time later Elizabeth married Walter Richard Pickett, son of Daniel Pickett and Mary How. Walter was another resident of Chudleigh, also a farmer, but a man of many talents. He worked with his father who owned the Chudleigh Hotel. His father, Daniel Pickett was convicted on 13th July 1832, about 18yrs of age, in Berkshire England for house breaking. He was transported to Hobart for 13 years. Before his arrival he spent some time on a prison hulk at sea. Daniel received his ticket of leave in March 1841. They had traction engines, chaff cutters, threshing machines and horses, draught, hack and ponies. As the railway line ran only to Chudleigh and was not completed to Mole Creek, they took tourists by horse and trap to the Mole Creek Caves. Elizabeth, with the help of her elder daughters, looked after the hotel, cooking, cleaning etc. Elizabeth had three daughters in her second marriage. When the 1914-18 war ended, the barman, realising that the beer supply was running out, diluted it with water, to try to prevent the riot which could have erupted should the supply have ceased. Walter at one time lost some fingers in a chaff cutter, and also blew a thumb off his other hand with a gun when out shooting. On retirement Elizabeth and Walter lived at Mole Creek. Elizabeth died in August of 1928 and Walter in November of the same year. 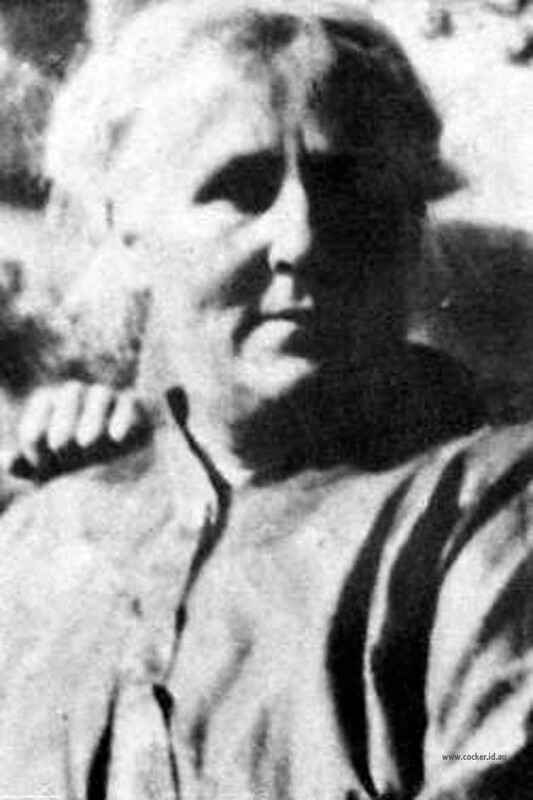 4-Bernice Lucy Alma Ashdown was born on 24 Sep 1889 in Deloraine, Tasmania and died on 26 Sep 1889 in Deloraine, Tasmania. 4-Bernice Melva Beatrice Ashdown was born on 15 Nov 1890 in Deloraine, Tasmania and died on 31 Oct 1964 at age 73. Bernice married Sydney Cecil Clare Jones, son of Henry Jones and Martha Wells, on 20 Oct 1913 in Latrobe. Sydney was born on 18 Dec 1886 in Port Sorell and died on 19 Apr 1954 at age 67. They had four children: Audrey Mattie, Royal Clare, Gwendoline Elsie and Archibald Arthur. 5-Audrey Mattie Jones was born on 11 Dec 1913 in Latrobe. Audrey married Eric James Langdon, son of James Henry Langdon and Ethel Agnes Coombe. Eric was born on 25 Mar 1912 in Deloraine, Tasmania. They had two children: Patricia and John. 6-Patricia Langdon was born on 31 Dec 1940. Patricia married Ian Kitto. Ian was born on 23 Aug 1938. They had four children: Marcus, Mandy, James and Simon. 7-Marcus Kitto was born on 25 May 1966. 7-Mandy Kitto was born on 17 Dec 1967. 7-James Kitto was born on 5 Oct 1969. 7-Simon Kitto was born on 26 Jul 1971. 6-John Langdon was born on 22 Nov 1943. John married Harley Wrankmore. Harley was born on 10 Aug 1943. They had two children: Natalie and Damien. 7-Natalie Langdon was born on 13 Jan 1967. 7-Damien Langdon was born on 13 Dec 1969. 5-Royal Clare Jones was born on 21 Jan 1915 in Chudleigh, Tasmania, died on 24 Nov 1979 at age 64, and was buried on 27 Nov 1979 in Carr Villa Cemetery, Launceston, Tasmania. Royal married Merle Jessica Jago, daughter of Albert Jago and Jessie Alice Higgs. Merle was born on 23 Apr 1923, died on 11 Jun 1975 in Fitzroy, Victoria at age 52, and was buried on 13 Jun 1975 in Devonport. They had six children: Lynette, Leon, Elizabeth, Yvonne Maree, Judith and Peter. 6-Lynette Jones was born on 21 Jan 1946. Lynette married Leigh McKendrick. Leigh was born in 1940. They had four children: Jan, Christopher, Sonya and Cameron Robert. 7-Jan McKendrick was born in 1961. 7-Christopher McKendrick was born on 14 Nov 1962. 7-Sonya McKendrick was born in Feb 1971. 7-Cameron Robert McKendrick was born in Nov 1973 and died on 30 Jul 2007 in Gold Coast, Queensland at age 33. Cameron married Tiana in 2007. Lynette next married John Glyn. John was born about 1945. 6-Leon Jones was born on 27 Sep 1948. Leon married Rosemary Molross. Rosemary was born on 12 Sep 1947. They had two children: Carmen and Kylie. 7-Carmen Jones was born in Feb 1972. 7-Kylie Jones was born in Oct 1973. 6-Elizabeth Jones was born on 25 May 1950. Elizabeth married Anthony Nolan. Anthony was born about 1948. They had two children: Ricky and Michael. 7-Ricky Nolan was born on 27 Sep 1967. 7-Michael Nolan was born on 12 Mar 1969. 6-Yvonne Maree Jones was born on 13 Nov 1951. Yvonne married Peter Smith. Peter was born on 2 Sep 1949. They had two children: Conrad and Natalie. 7-Conrad Smith was born on 11 Jun 1972. 7-Natalie Smith was born on 12 Sep 1975. 6-Judith Jones was born on 22 Jul 1955. Judith married Thomas Colraine. Thomas was born on 8 Oct 1950. They had one son: Alexander. 7-Alexander Colraine was born on 27 Jun 1981. 6-Peter Jones was born on 6 Jun 1960. Peter married Terri Sweeney. Terri was born about 1962. They had one son: Leon. 7-Leon Jones was born on 4 Feb 1985. Royal next married Faye Hodgetts. Faye was born on 3 Dec 1914. 5-Gwendoline Elsie Jones was born on 9 Aug 1917 in Deloraine, Tasmania and died on 6 Jul 1987 at age 69. Gwendoline married Bernard Thomas Barry. Bernard was born on 14 Dec 1897 and died on 4 Aug 1972 at age 74. They had one daughter: Jillian Margaret. 6-Jillian Margaret Barry was born on 6 Nov 1949. Jillian married Kiees Kuys. Kiees was born on 2 Jan 1946. They had three children: Jason, Nicholas and Shamila Angela. 7-Jason Kuys was born on 27 Jul 1972. 7-Nicholas Kuys was born on 29 Jul 1973. 7-Shamila Angela Kuys was born on 16 Dec 1984. 5-Archibald Arthur Jones was born on 12 Sep 1919 in Mole Creek. Archibald married Nancy Alma Slater. Nancy was born on 21 Feb 1921 and died on 26 May 1985 at age 64. They had three children: Suzanne Marci, David Russell and Deborah Anne. 6-Suzanne Marci Jones was born on 14 Sep 1949. Suzanne married Leslie Charry. Leslie was born on 1 May 1946. They had two children: Darren and Christopher. 7-Darren Charry was born on 16 May 1968. 7-Christopher Charry was born on 29 Jun 1970. 6-David Russell Jones was born on 27 Aug 1951. David married Rosalie Rothall. Rosalie was born on 19 Sep 1955. They had two children: Brendon David and Melissa Rosalie. 7-Brendon David Jones was born on 19 Feb 1976. 7-Melissa Rosalie Jones was born on 11 May 1978. 6-Deborah Anne Jones was born on 11 Apr 1953. Deborah married Kenneth Singleton. Kenneth was born on 23 Nov 1950. They had two children: Simone and Kylie. 7-Simone Singleton was born on 2 Nov 1972. 7-Kylie Singleton was born on 16 Aug 1975. 4-William Henry Cyril Ashdown was born on 6 Dec 1892 in Deloraine, Tasmania and died on 7 Apr 1949 at age 56. William married Helen May Sherriff on 23 Feb 1916 in Methodist Church, Chudleigh. Helen was born on 25 Aug 1894 and died on 20 Nov 1975 at age 81. They had four children: Corrie Ella, Joy Annie Elizabeth, Betty Sybil and Dawn Jean. 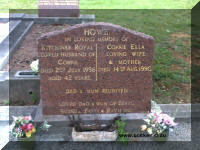 5-Corrie Ella Ashdown was born on 18 Jan 1917 in Deloraine, Tasmania, died on 14 Aug 1990 at age 73, and was buried in Mole Creek Public Cemetery. Corrie married Kitchiner Royal Howe, son of George Howe and Effie Sarah Jane Rawnsley. Kitchiner was born on 27 Dec 1914 in Mole Creek, died on 2 Jul 1956 at age 41, and was buried in Mole Creek Public Cemetery. They had four children: Berris Elizabeth, Russell Cyril, Patsy Helen and Raymond. 6-Berris Elizabeth How was born on 25 Sep 1932. Berris married Leo Gordon Eric Howe. Leo was born on 20 Apr 1923 and died on 1 Jun 1987 at age 64. They had two children: Lorraine and Cindy. 7-Lorraine Howe was born on 5 Apr 1959. Lorraine married Colin William Crawford. Colin was born on 14 Sep 1957. They had one daughter: Andrea Laura. 8-Andrea Laura Crawford was born on 4 Jan 1985. 7-Cindy Howe was born on 24 Apr 1962. Cindy married Robert Clyde Reardon. Robert was born on 16 Dec 1961. 6-Russell Cyril How was born on 9 Jun 1938. Russell married Anne Lydia Schoemaker. Anne was born on 2 Sep 1939. They had four children: Dean Kitchener, Lindy Anne, Jason Roelf and Georgina Janny. 7-Dean Kitchener How was born on 30 Dec 1960. Dean married Leanne Robins. Leanne was born on 6 Aug 1962. They had one son: Aaron Russell. 8-Aaron Russell How was born on 19 Apr 1984. 7-Lindy Anne How was born on 19 Feb 1963. 7-Jason Roelf How was born on 16 Oct 1965. 7-Georgina Janny How was born on 6 Jun 1975. 6-Patsy Helen How was born on 27 Feb 1946. Patsy married Daryl John Blair. Daryl was born on 28 May 1942. They had three children: Todd Andrew, Luna Louise and Phonse Kitchener. 7-Todd Andrew Blair was born on 20 Oct 1967. 7-Luna Louise Blair was born on 30 Aug 1968. 7-Phonse Kitchener Blair was born on 1 May 1974. 6-Raymond How was born on 5 Mar 1952. Raymond married Denise Howe. Denise was born on 22 Sep 1949. They had two children: Natasha and Troy. 7-Natasha How was born on 4 Dec 1973. 7-Troy How was born on 5 Mar 1976. 5-Joy Annie Elizabeth Ashdown was born on 1 Jul 1920, died on 26 Jul 1984 at age 64, and was buried on 30 Jul 1984 in Carr villa Pergola Wall West 12 Carr Villa Cemetery Launceston. Joy married Joseph John Blair, son of Allan Blair and Elizabeth Scott. Joseph was born on 21 Oct 1917 in Mole Creek, died on 5 Jan 1959 at age 41, and was buried on 7 Jan 1959 in Carr villa Pergola Wall West 12 Carr Villa Cemetery Launceston. They had two children: Kevin John and Joy Sue. 6-Kevin John Blair was born on 20 Oct 1940. Kevin married Maria Ann Sarnak. Maria was born on 2 Sep 1956. They had four children: Benjamin, John, Gnarie and Shane. 7-Benjamin Blair was born on 14 Jul 1973. 7-John Blair was born on 11 Jan 1974. 7-Gnarie Blair was born on 15 Aug 1976. 7-Shane Blair was born on 7 Jul 1980. 6-Joy Sue Blair was born on 13 Nov 1947. Another name for Joy is Sue. Joy married John Charles Houston. John was born on 1 Aug 1938. They had two children: Scott Anthony and David John. 7-Scott Anthony Houston was born on 7 Oct 1971. 7-David John Houston was born on 10 Jul 1974. 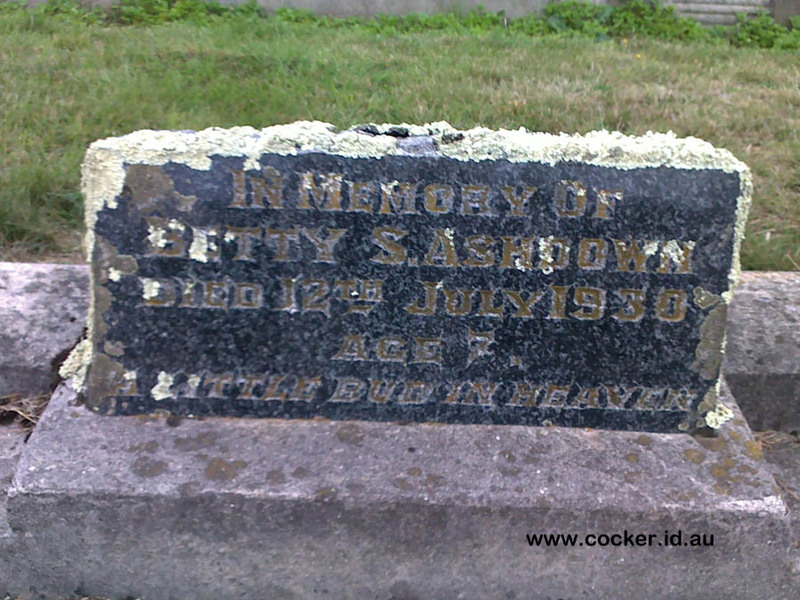 5-Betty Sybil Ashdown was born on 17 Jun 1923, died on 25 Jul 1930 in the Launceston General Hospital at age 7, and was buried in Jul 1930 in Mole Creek Public Cemetery. 5-Dawn Jean Ashdown was born on 1 Mar 1927 and died on 2 Sep 1976 at age 49. Dawn married Ronald Joyce Howe. Ronald was born on 8 Mar 1927. They had five children: Austin Donald, Sybil Dawn, Louise Helen, Timothy Royce and Raylene Margaret. 6-Austin Donald Howe was born on 17 Sep 1951. Austin married Jennifer Jean Dutson. Jennifer was born on 16 Jul 1946. They had three children: Clifford James, Natalie Jean and Kristie Dawn. 7-Clifford James Howe was born on 27 Jan 1974. 7-Natalie Jean Howe was born on 30 Apr 1976. 7-Kristie Dawn Howe was born on 7 Nov 1978. 6-Sybil Dawn Howe was born on 24 Dec 1953. Sybil married George Costuik. George was born on 17 Aug 1951. They had two children: James and Anthony. 7-James Costuik was born on 27 Jun 1977. 7-Anthony Costuik was born on 28 Nov 1980. 6-Louise Helen Howe was born on 17 May 1956. Louise married Phillip Lees. Phillip was born on 21 Sep 1954. They had two children: Megan Clare and Nathan Jade. 7-Megan Clare Lees was born on 3 Sep 1980. 7-Nathan Jade Lees was born on 25 Feb 1985. 6-Timothy Royce Howe was born on 11 Nov 1960. Timothy married Debbie Maree Thorpe. Debbie was born on 3 Dec 1962. 6-Raylene Margaret Howe was born on 9 Nov 1963. Raylene married Gerald Goyer. Gerald was born on 30 Aug 1961. They had one daughter: Carissa Jean. 7-Carissa Jean Goyer was born on 1 Nov 1983. 4-Herley Millicent Avis Ashdown was born on 3 Mar 1896 in Deloraine, Tasmania and died on 12 Aug 1938 at age 42. Another name for Herley was Early Millicent Aves. Herley married Charles Robert Minchin, son of Henry Robert Minchin and Frances Wilson, on 17 Aug 1928 in St. Aidans Church, Lindisfarne. Charles was born on 9 Aug 1896 in Hobart, Tasmania and died on 25 Oct 1962 at age 66. 4-Corrie Edwina Elizabeth Ashdown was born on 5 Apr 1899 in Deloraine, Tasmania. Corrie married Arthur John Saville, son of John Saville and Ellen Saunders, on 5 Sep 1916 in St. Georges Church, Burnie. Arthur was born on 12 Dec 1893 in Deloraine, Tasmania. They had four children: Cyril Arthur, Glen Terrence, Don and Shirley. 5-Cyril Arthur Saville was born on 12 Mar 1917 in Waratah, Tasmania. 5-Glen Terrence Saville was born on 22 Aug 1918 in Waratah, Tasmania. 4-Greta Mary Pickett was born on 6 Apr 1905 in Deloraine, Tasmania and died on 22 Mar 1981 at age 75. Greta married Derwent Percy George Howe, son of George Howe and Effie Sarah Jane Rawnsley, on 15 Sep 1928 in Mole Creek. Derwent was born on 5 Jan 1908 in Mole Creek, died on 17 Jan 1984 at age 76, and was buried in Mole Creek Memorial Wall. They had five children: Walton Pickett, Elizabeth Pickett, Graeme Pickett, Susan Pickett and Desmond George. 5-Walton Pickett Howe was born on 29 Apr 1929. Walton married Dorothy Joan Davey. Dorothy was born on 23 Jan 1934. They had four children: Michael Walton, Larry James, Terrance Joseph and Sonya Teresa. 6-Michael Walton Howe was born on 11 Sep 1952. 6-Larry James Howe was born on 7 Dec 1953. Larry married Yvonne Williamson. Yvonne was born on 4 Sep 1957. 6-Terrance Joseph Howe was born on 29 Dec 1954. Terrance married Sonia Kelly. Sonia was born on 20 Jan 1950. They had two children: Melissa Anne and Jason Terrance. 7-Melissa Anne Howe was born on 19 Aug 1974. 7-Jason Terrance Howe was born on 27 Jul 1976. 6-Sonya Teresa Howe was born on 24 Oct 1959. Sonya married David John Howe. David was born on 9 Jun 1956. They had two children: Joshua David and Samuel John. 7-Joshua David Howe was born on 8 Oct 1987. 7-Samuel John Howe was born on 12 Jun 1991. 5-Elizabeth Pickett Howe was born on 10 Sep 1930. Elizabeth married Henry Thomas Taylor. Henry was born on 4 May 1918 and died on 6 May 1987 at age 69. They had two children: Richard David and Ann Elizabeth. 6-Richard David Taylor was born on 27 Dec 1966. 6-Ann Elizabeth Taylor was born on 24 Jun 1969. 5-Graeme Pickett Howe was born on 27 Jan 1932. Graeme married Jean Audrey Warren. Jean was born on 28 Jul 1935. They had six children: Marie Alice, Julie Elizabeth, Phillip Graeme, Wayne Ellis, Jeanene Robyn and Markis Damien. 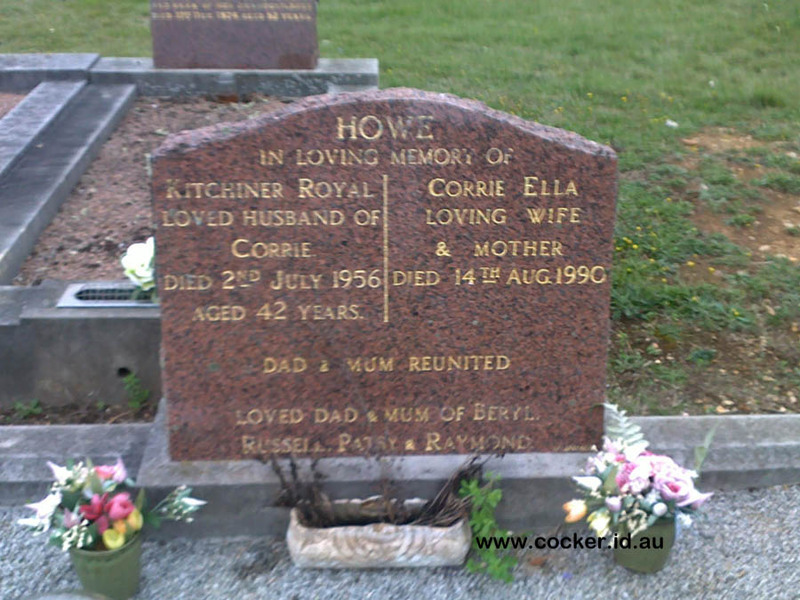 6-Marie Alice Howe was born on 19 Jan 1952 and died on 2 Dec 1957 at age 5. 6-Julie Elizabeth Howe was born on 10 Oct 1954. Julie married Paul Frederick Pinkard. Paul was born on 9 Apr 1959. They had two children: Dione and Oliver. 7-Dione Pinkard was born on 15 Jul 1975. 7-Oliver Pinkard was born on 5 Dec 1977. 6-Phillip Graeme Howe was born on 21 Jul 1956. Phillip married Joanne Estelle McClymont. Joanne was born on 21 Feb 1959. They had two children: Justin Philip and Emilie Joanne. 7-Justin Philip Howe was born on 13 Jan 1980. 7-Emilie Joanne Howe was born on 9 Mar 1982. 6-Wayne Ellis Howe was born on 29 Sep 1958 and died on 10 Oct 1958. 6-Jeanene Robyn Howe was born on 19 Mar 1960 and died in Jul 1960. 6-Markis Damien Howe was born on 23 Jan 1975. 5-Susan Pickett Howe was born on 11 Jul 1936. Susan married Henry Peter Hall. Henry was born on 3 Mar 1925. They had three children: Suzanne Elizabeth, Gregory Peter and Katherine Mary. 6-Suzanne Elizabeth Hall was born on 22 Mar 1956. Suzanne married Kim Dudley Saltmarsh. Kim was born on 20 Oct 1950. 6-Gregory Peter Hall was born on 12 Jan 1958. Gregory married Alan Maree Dilger. Alan was born on 22 Feb 1961. 6-Katherine Mary Hall was born on 2 Oct 1962. 5-Desmond George Howe was born on 4 Oct 1941, died on 2 Jan 2006 in the Launceston General Hospital at age 64, and was buried on 5 Jan 2006 in Cremated at Carr Villa. Desmond married Corinne Sandra Howe. Corinne was born on 29 Jul 1945. They had three children: Kim Desmond, Leanne Marie and Darren John. 6-Kim Desmond Howe was born on 3 Dec 1962. Kim married Monica. 6-Leanne Marie Howe was born on 12 Aug 1964. 6-Darren John Howe was born on 7 Oct 1969. Darren married Sheridan. 4-Alison Elizabeth Pickett was born on 14 May 1913. 4-Crissie Ada Amelia Pickett was born on 14 Nov 1914 and died on 15 Sep 1969 at age 54. Crissie married Bertram Francis Minchin, son of Henry Robert Minchin and Frances Wilson. Bertram was born on 12 Jan 1911 in 203 Melville Street, Hobart, Tasmania. They had two children: Alwyn and Dianne. 5-Alwyn Minchin was born on 2 Oct 1939. Alwyn married Michael Charles Gathercole. Michael was born on 23 Nov 1938. They had four children: Marcus, Scott, Natalie and Todd. 6-Marcus Gathercole was born on 9 May 1961 and died on 1 Aug 1967 at age 6. 6-Scott Gathercole was born on 11 Jun 1963. 6-Natalie Gathercole was born on 15 Jan 1969. 6-Todd Gathercole was born on 25 Nov 1970. 5-Dianne Minchin was born on 21 Apr 1942. Dianne married Kevin Fleury. Kevin was born on 4 Jan 1941. They had one daughter: Karinna. 6-Karinna Fleury was born on 19 Jan 1976.